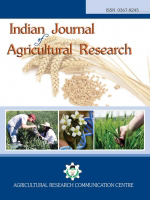 Studies to assess the influence of plant population and management under the System of Rice Intensification (SRI) on crop-weed competition was conducted in farmer's field at Thrissur district, Kerala, during the second crop seasons (rabi) of 2005-06 and 2006-07. The experiment was laid out in split plot with two mainplot treatments of weeding and unweeding and five subplot treatments of spacing and management. Increase in crop density under closer spacing significantly reduced the number and dry matter production of weeds. Cono weeding was not effective in controlling weeds growing very close to the rice plants. Number and dry matter production of weeds were higher in SRI plots. The uptake of nutrients by weeds was minimum in closer spacing. Weed control efficiency was also maximum for closer plant spacing of 10 cm x 10 cm. The highest grain yields of 8858 kg/ha and 8358 kg/ha during first and second years of study were observed in closer spacing of 10 X 10 cm followed by 20 x 10 cm both under normal package of practices with weeding. The yield obtained from 20 x 10 cm plots with weeding and 10 cm x 10 cm without weeding were on par showing the importance of closer spacing as a weed management strategy. Among the weeded plots, the lowest grain yield of 5250 kg/ha was observed in SRI plots with cono weeding. Uptake of nutrients by the crop was higher in plots with closer spacing with weeding. Bhagat, R. M., Bhuiyan, S. I. and Moody, K.(1996). Water, tillage and weed interactions in low land tropical rice; a review. Agric. Water Mgmt 31:165-184. De Datta, S. K. (1981). Principles and Practices of Rice Production. John Wiley and Sons, New York, 618p. Islam, M.J. and Molla, H.R. (2001). Economic weeding method for irrigated rice production in Bangladesh. Agric. Water Mgmt. 46(3):267-276. KAU (2002). Package of Practices Recommendations-'Crops' 2002. Directorate of Extension, Kerala Agricultural University, Thrissur, 267p. Latif, M.A. Islam, M.R., Ali, M.Y., and Saleque, M.A. (2005). Validation of the system of rice intensification (SRI) in Bangladesh. Field Crops Res. 93(2-3):281-292. Moody, K. (1991). Weed management in rice. In: Hand Book of Pest Management in Agriculture. [Pimental, D. (ed. )], CRC Press, Florida. pp.301-328. Rao, V.S. (2000). Principles of Weed Science (2nd ed.). Oxford and IBH, New Delhi, 557p. Singh, S.K. and Talati, J. (2005). Impact of the system of rice intensification (SRI) on rice yields – results of a new sample study in Purulina district, India. IWMT – Tata Water Policy Research Highlights No. 47. International Water Management Institute, India programme, Anand.